Eclipse Digital have carried out numerous installations of AV displays and digital signage media players at public buildings including schools, corporate offices, construction project offices and care homes. We always ensure that our installations are carried out professionally and with care at the most suitable time for you. We believe, similar to Safecontractor, in offering the best industry practise when it comes to installation. 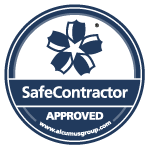 Safecontractor membership proves our commitment to health and safety competence. CSCS is the leading skills certification scheme within the UK construction industry. This scheme provides proof that individuals working on construction sites have the required training and qualifications for the type of work they carry out.